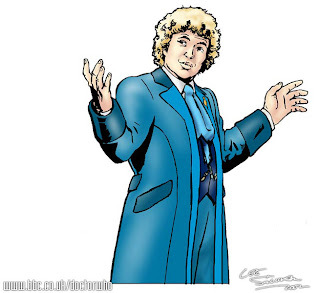 Making My 6th Doctor Costume: Honestly, Dragon! 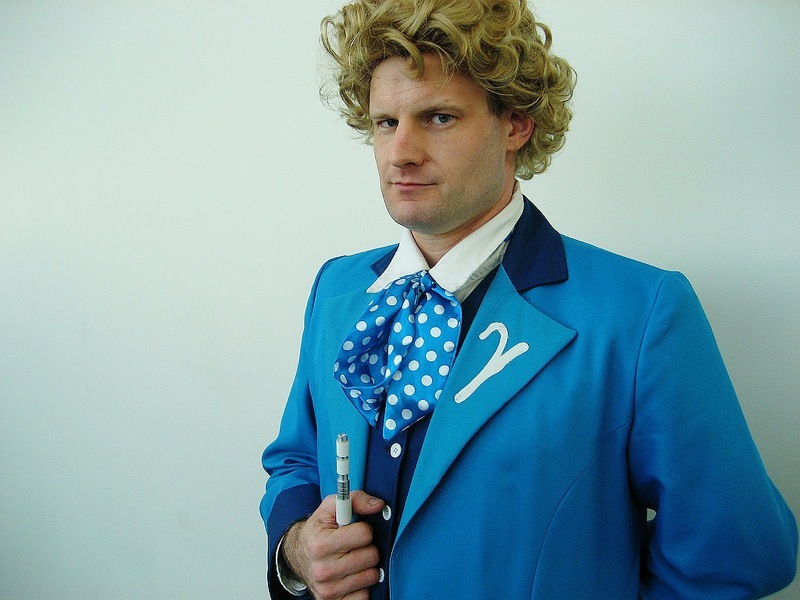 I'm by no means the first to make a replica of the iconic Six Frock Coat. The best to date by a long way has been the Cloth Ears version - but the worst to date has to go to the eBay seller Honest Dragon! 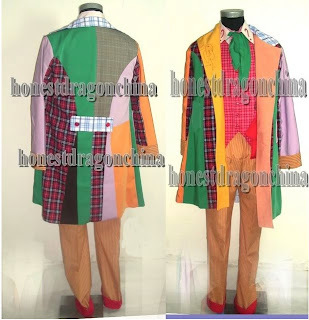 In some respects it can be looked at as a childish parody of the coat, but credit to them, they have seen and taken on board the panels that make the coat, with every piece represented here in one form or another. I’m reminded of a classic Morecambe and Wise sketch, where Eric is accused of play the wrong tune on a piano. He reposts that he is “playing all the right notes – not necessarily in the right order”. However, it’s total is not the sum of it’s parts, as the pattern is much lacking and the drape leaves a lot to be desired. 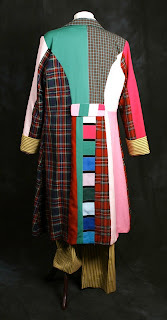 Now I am basing a lot of what I am saying on the photographs I have seen and on personal experience of other garments they have made (my own Tennant Coat making grew out of a dis-satisfaction with the coat I bought from them). I’m afraid I could never bring myself to buy another coat from them! But I have spoken with a couple of people who do have Honest Dragon Six Coats, including the colour variants . 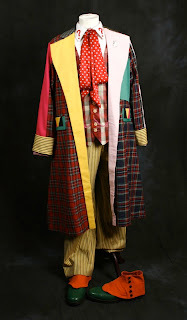 . .
Finding a good replica of the 6th’s Doctor's multi-colored ‘totally tasteless’ coat is not an easy task. If you ask me it's probably one of, if not THE hardest peice to replicate out of all of the Doctor's costume items. 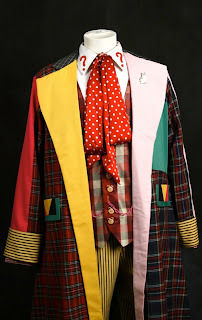 If one doens't have the time, patience, and skills to modfify/draw up thier own frock coat pattern plus locate even ballpark matches for all of the fabrics involved, then your options are slim. For the high end, there was the Cloth Ears replica. Sadly, that part of thier shop is now closed and that option is a thing of the past. For the low end, there's... Honest Dragon China. 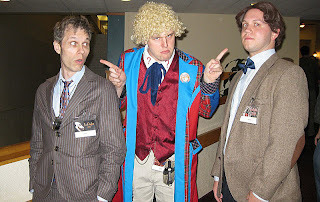 Yep, those guys who sell all of the 10th & 5th Doctor cosplay items on ebay (sometimes I believe also under the name Sonice pPayer though these might be local Chinese competitors) along with a large swath of Anime inspired cosplay items. For anyone who has even looked at Honest Dragon's ebay store pictures I'm sure you know, 100% accuracy is NOT what you'll be getting. To thier credit though, they do at least try and they're pretty much the only option in this price range. Actually they're one of the only options for this coat, period. Other custom online tailors wouldn't touch this coat with a ten foot pole with all the work and fabric matching involved. I know. I've asked. Many times. Bearing in mind the custom pattern, the *fourteen* different fabrics (as this blog attests!) that have to be matched and the fact these fabrics have to be of the same weight so as not to pull the coat oddly in any direction.... it's a bit of a minor miracle Honest Dragon even offers this. I've owned this coat now for 2 1/2 years. I even owned the Blue "Real Time" varient they make for about 2 years before I sold it on in February 2010. I'll comment a little on that version as well. Overall, I'm happy with it, even though I'm jumping at the first chance I get to upgrade. Understand though, that's the perfectionist in me talking, I have trouble really faulting Honest Dragon, all factors considered. Here's the thing: It is not accurate. It is not high end quality. However for a costume, I can't deny it's good value for the money. Colors are off. Pink is too light. Green too vibrant. Tartans are generally too dark or too tight a pattern. The cuffs which should be a nice yellow pillow ticking are a drab brown corduroy. 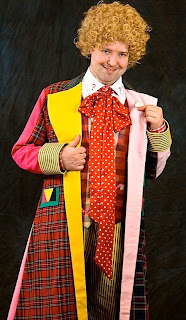 (I'm cheating a little with mine, I had the cuffs replaced with extra pillow ticking from our Cloth Ears Trousers). 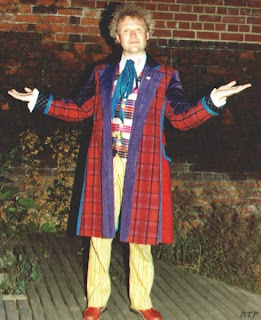 The corduroy is used for thier trousers though, so I'll show a picture of those so you get the idea. The main reason for this is they are forced to go with 'best available' fabrics available in thier local market that week. It's what helps keeps the price down. For the Blue Version there's more leeway with that interpretation and with shades of solid blue they do much better here. I have no major complaints about the blue fabrics. Also the pattern while suggesting the Six Coat, is off, particularly with the collar & lapel shape/width. Bascially the collar is far too small and narrow. 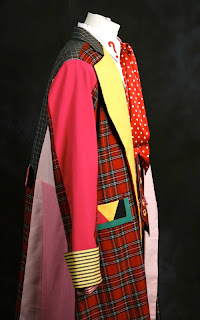 The lapels start a touch wide and the taper too aggressively thin by the bottom. The pockets flap are there for decoration, although they are functional, they open behind the flap and not inside of it. The pattern on the blue version for some reaosn is a bit different. It was slightly longer by an inch or two. The collar was wider. 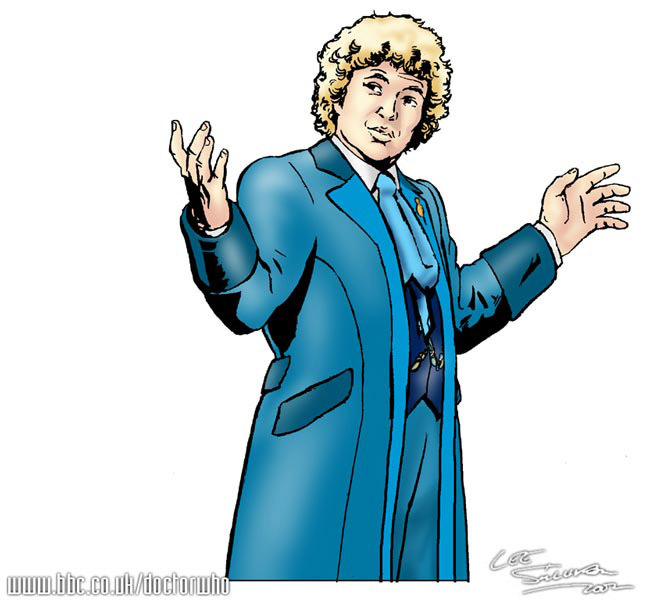 The lapel was nicely more proportionate with the collar but it tapered in about mid-chest rather than running the entire length of the coat. The back seam or ‘belt’ area was higher too. just below mid-back, So the rear vent went *quite* high! Of course - there's no cat pin. (Again mine is the Cloth Ears Cat Pin added later) Although they can sew on a 'faux cat pin' form white or black pleather if you ask. 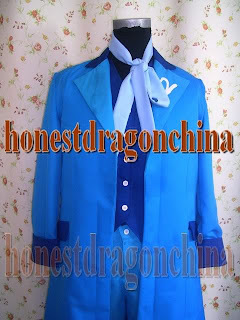 You can see the ‘pleather’ white fake cat pin on pictures of the Blue Six coat. It's something I'd recommend avoiding. 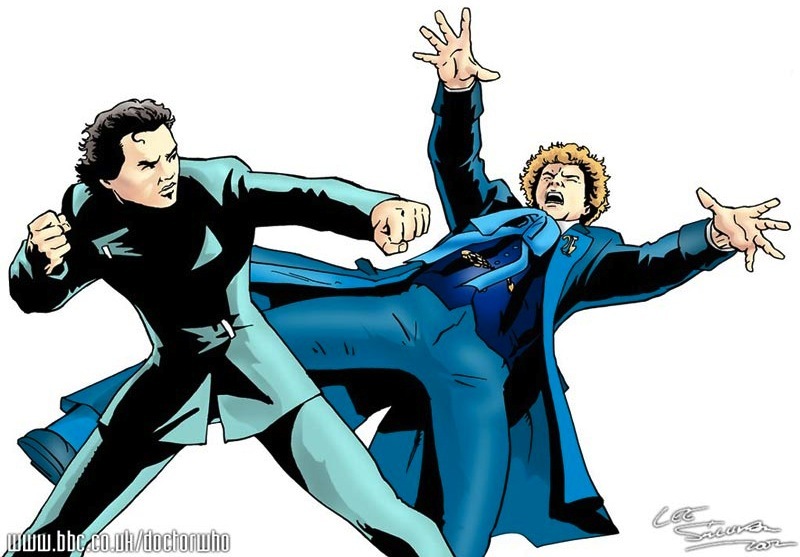 While not accurate, it's still representative of the coat. If you’re a Who fan, you'll still instantly recognize it. It's still at least vaguely in the ballpark. The fit is actually fairly good with the online measurements they take. It rests nicely on the shoulders and lands where it should on the sleeve length. It's got a nice minor flair in the skirt I like a lot. Pockets are functional. Customer Service is pretty good. Honest Dragon are very good about e-mails and usually get back to you in 8 hours or less. They try and accomodate any reasonable request for customizing. The turnaround is lightning fast- usually 1-2 weeks for making the costume and another 1-3 weeks shipping, unless you shoose expedited which can take as little as 3 days. Construction quality is decent. Not spectacular mind you, but again, for the price it’s not bad. Seamstress work seems solid with no irregular seams, wonky fabric cutting or the like. It’s still what I’d call a costume coat, but a good level or two above a Rubies or what you’d buy in a bag for $60.00 at a Halloween shop. More or less on par with discount Wal-Mart clothing. The lining is thin, but again you’re not wearing this for winter weather, but for a costume. 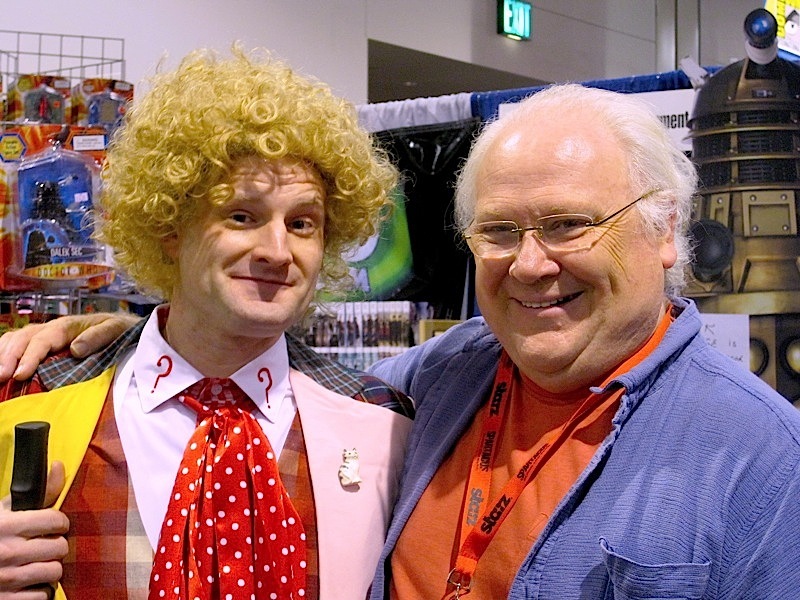 Besides, on a hot con floor a thin coat can be a blessing. After 2+ years, it’s held up pretty well. There’s some minor seam splitting in the center of the back. 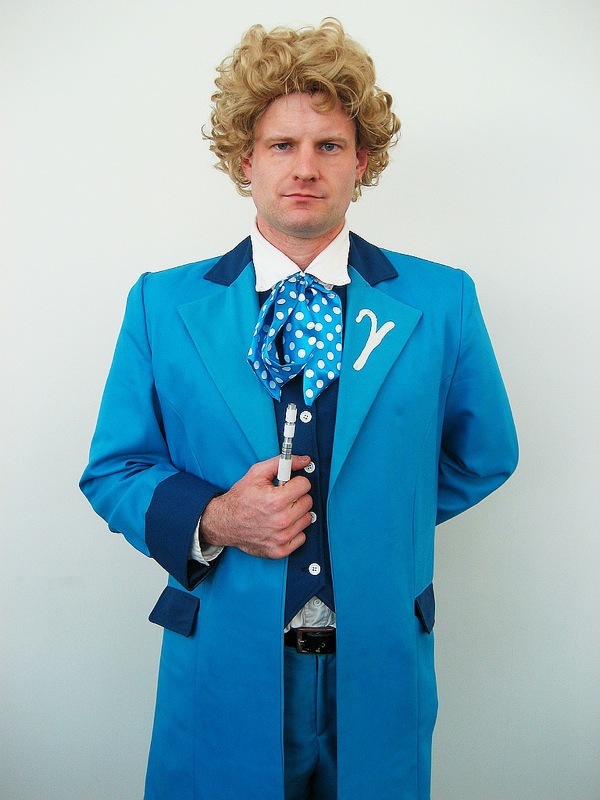 On my Blue Coat, one of the pocket linings came partially undone. Otherwise no real issues. The biggest plus is the price. I paid for both of these as part of an overall Six Costume. In both cases and with shipping it was about $300.00. Based on the shipping quote ($85.00) and what I've been quoted seperately for the vest and shirt (around $30.00 each) in the past the value of this coat alone is about $130.00 USD. So I'd say it's very good value for it's price point. 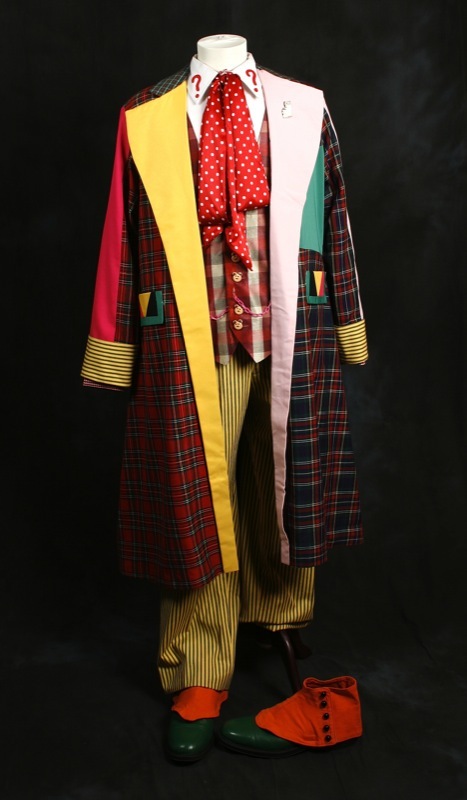 Bottom Line: If screen accuracy and high end museum quality costumes are your bread and butter then AVOID this coat. If 'reasonably close enough' works for you or even if you're operating on a tight budget and money is paramount then I'd say grab it. 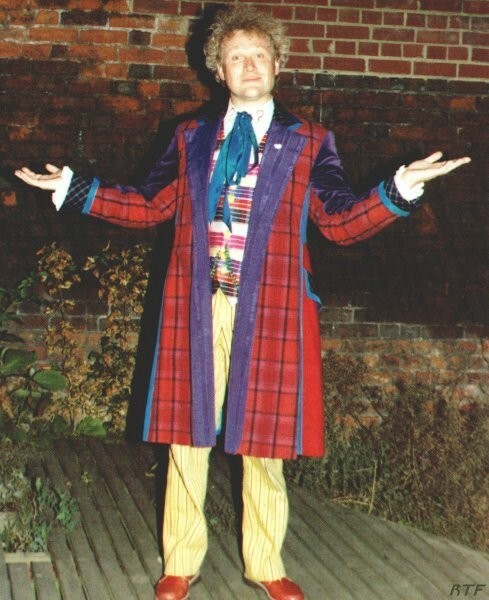 This is based on Colin’s stage coat from when he took over for Pertwee in the Ultimate Adventure stage show. I love this coat. Out of all of the 6th Doctor’s costumes, this one was my favorite. 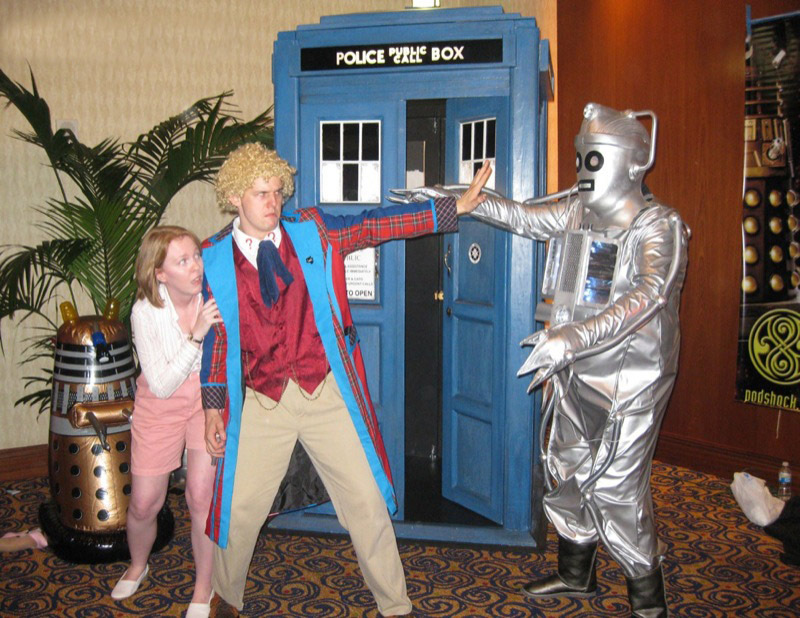 When I was first building the costume, it came down to this or the Big Finish blue coat. This felt like a nice middle ground between what I liked about the original, and the blue coat. This is very comfortable coat. Not too heavy or thick, so no worries about really overheating in it during warmer weather (like when I go to the Georgia Renfair). I have worn this coat many times outside of costuming, especially around Easter,(Including most of my wrestling matches during the later half of 2009) and have had no problems with it outside of one pocket getting a tear (Though that was more due to stuff I was carrying than normal wear and tear) It is a majorly comfortable coat. The coat is not 100% accurate. HDC contacted me during construction to say that the purple material needed was just not going to be available within a reasonable amount of time. More blue was used instead, with a darker blue being used on the shoulders. The plaid on my coat also has green worked into it, while the original coat did not. 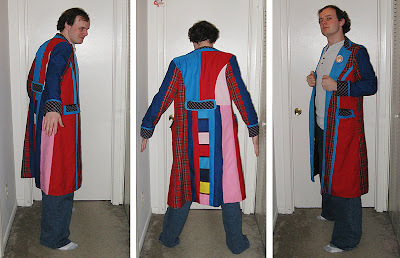 I'm not sure how accurate the back is, because I’ve never found photos of the actual coat’s back before. NOW, with that being said, I have no problems with the inaccuracies. They consulted with me about what colors I'd like instead of the purple, so good on them for being willing to make adjustments. Really, only one major negative for me on this. The pocket flaps don’t actually cover the pockets. the pocket holes are BEHIND the flaps, which seems kinda weird to me. 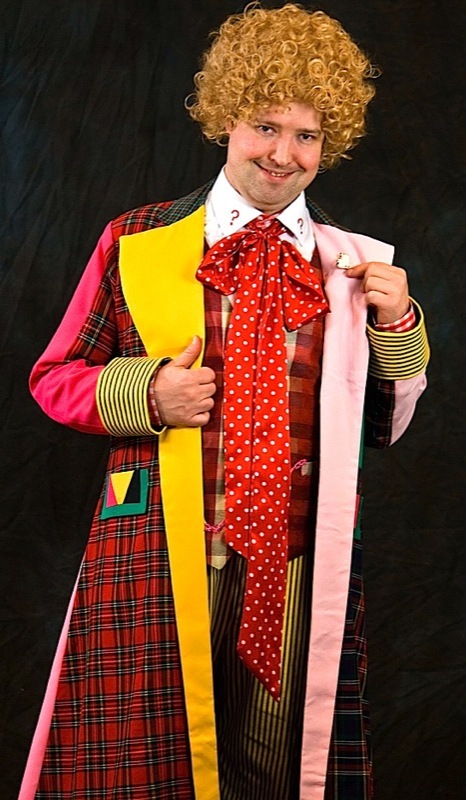 Well, thanks to the alternate colors, I have a rather unique six coat that still fits within the design scheme of the show/stage coats! Was it worth the money? Yup! I think I wound up paying around $100 or so for it? (Been a while, sorry I can’t recall the actual price) and that was counting shipping fees. I love my six coat! Thanks to Bob Mitsch and Colley for their reviews.